I'm still trying to slog through my Rome pictures... but meanwhile, I'm feeling the pressure to start getting things ready. It's August, after all. Local kids are back to school here NEXT WEEK. I can't deny any longer that a new year is upon me. This year I've decided to try a different way to plan things out. 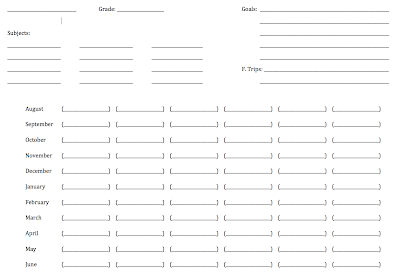 That big sheet of divided paper that lots of people use just doesn't work for me, so this year I made my own template on normal-sized paper. It gives me the entire year at a glance. Plus I like to list my goals for each child-- emotional, physical, whatever I need to remember to focus on. We still have a few things to finish up from last year. For Sunburst, that's Greece. 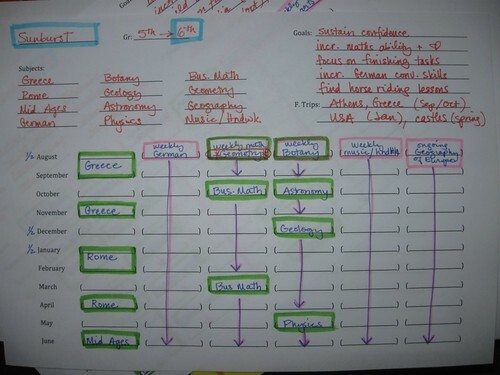 Usually Greece has to be carried over to Grade 6 anyway, so I'm not worried at all. Actually I'm excited-- as of this morning we're planning a field trip to Athens this fall. Yay!! And Moonshine... she's just not emotionally ready for the Old Testament stories yet, so we'll continue with stories from second grade-- there are way more than you can cover in second grade. We'll bridge the gap with Farming and LOTS of Math blocks, and then we'll hit the Old Testament in the early spring when Moonshine turns nine. With her birth date falling where it does we're always bridging the gap between years, waiting for the emotional/physical markers-- always-- before we jump in with both feet. It works for us. Anyway, here's a blank of the template I made to use this year. It's not fancy or anything, but I thought I'd throw it out there if anyone was interested. Maybe it will work for you, too. When you click on the image it should open up into a larger format that you can save and print from. Now I'm onto the micro planning of the first blocks... fun!! How is your planning going? Is anyone else getting excited to start a new year?? Oh yes, I am very excited, been getting started on more detailed planning the past few weeks. Last year for 3rd grade we did the Old Testament Creation story in the autumn but then did not continue until spring. It was not planned but I'm glad it happened that way, I know Chloe would not have been ready for them any earlier, even though she was already 9. We have still been reading from the second Jakob Streit book this summer. You sure do get to do some great field trips! omg, it's August. :-O help. I can't believe you were trying to convince me that you are not organized!! 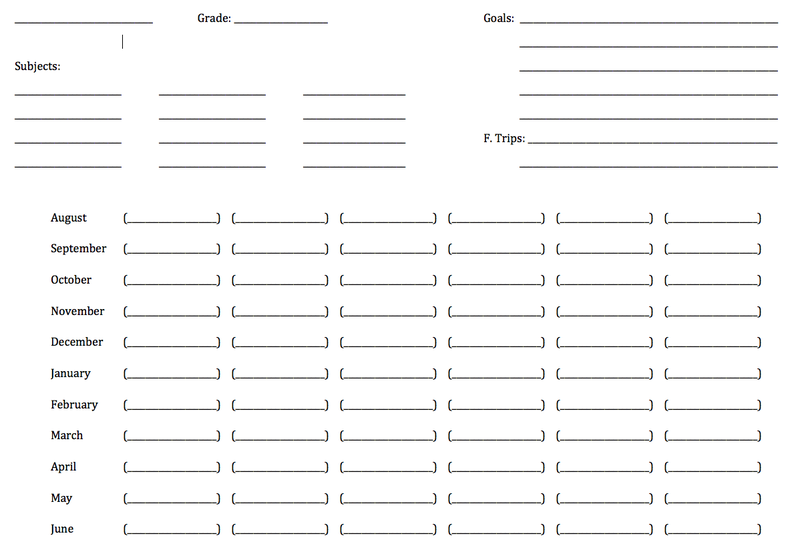 I have never made a single planning sheet for either of the kids. 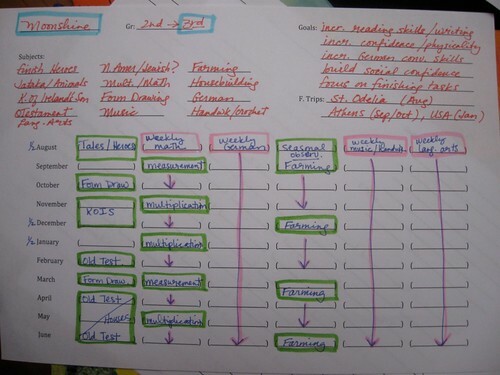 I love seeing how you homeschool, but it does make me feel a bit inadequate at the same time. LOL! Renee, we experienced the same thing with Sunburst and the Streit series. I think that's the beautiful thing about homeschooling-- we're not tied to a time table, and we can truly wait until they are ready. It can all just take as long as it takes! Love your wonderful ability to organize AND plan ahead!! We're so day to day right now...although, fencing, horse-back riding, and music lessons are all things I'm going to seek out this fall...wherever it is that we are. I printed out three copies of your schedule, just the same.